I shouldn’t complain, because I have a DNA match with Catherine and there may be some valid match to my McMaster ancestors of County Sligo. One problem with the tree above is that it is not likely that there were two brothers by the same name. The second problem is that the Abraham on the right was said to be born in 1805. This would be when Archibald was 75 if I have my birth for him right. I have that James and Archibald had another brother named Robert, but I left him out for clarity. 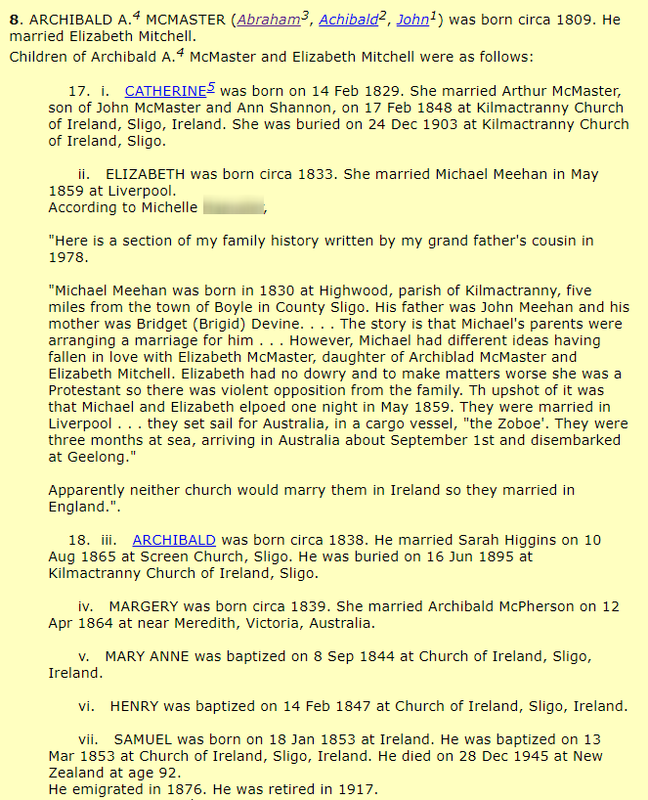 That means I have Catherine more closely related to me than Ancestry does. 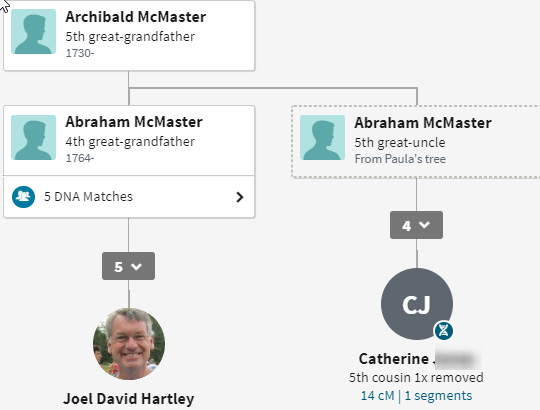 I am a fourth cousin once removed to Catherine. 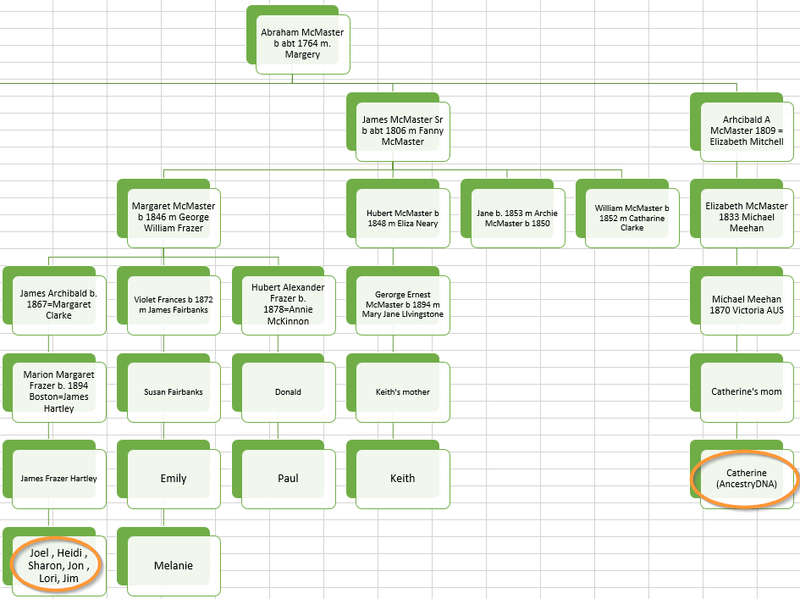 This was a case where it was worthwhile to look at more distant relatives in ThruLines. 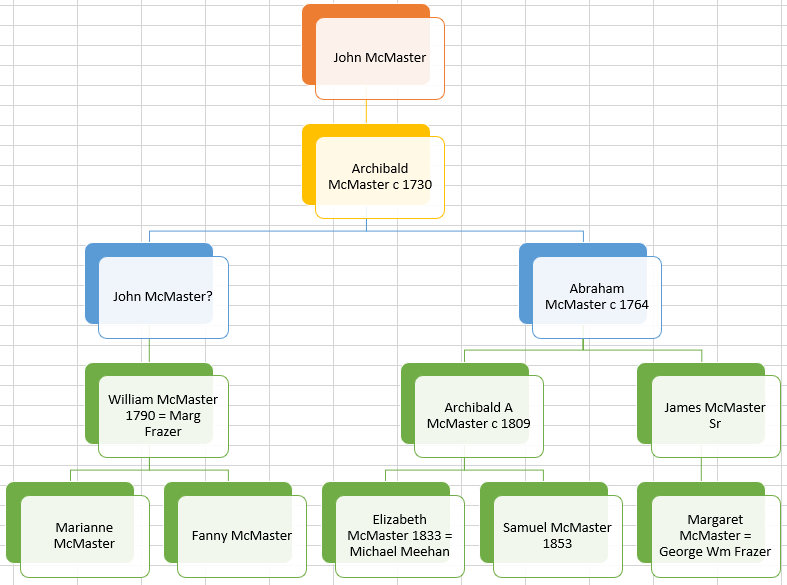 Based on land records there was a John McMaster who lived in the area where William lived. He could have been William’s father and Abraham’s son. Say he was born about 1760. He could have been the eldest son of Archibald. Traditionally men named the eldest son for their father. 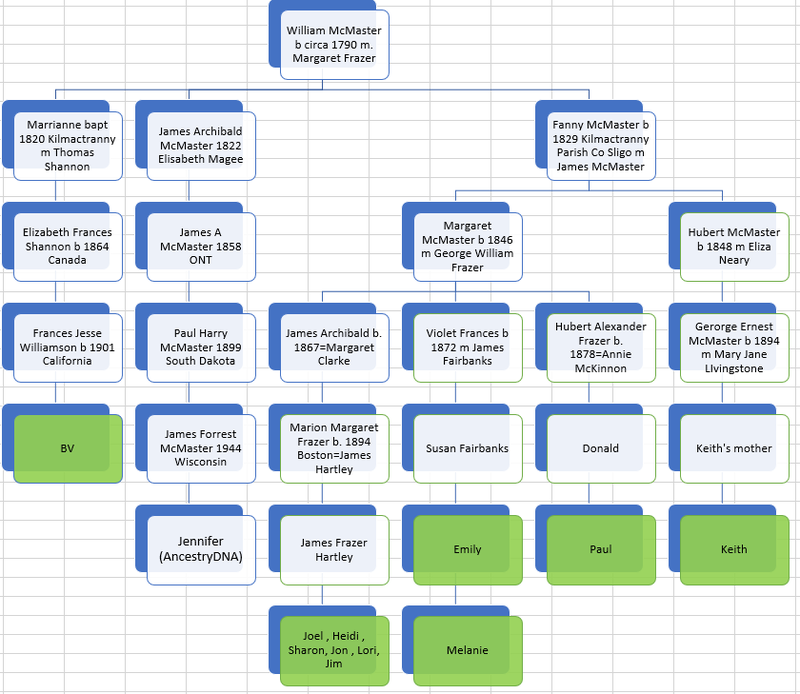 For me, this is the best way to explain the McMaster family based on the DNA and land records. Under the above scenario, Fanny married her first cousin once removed. 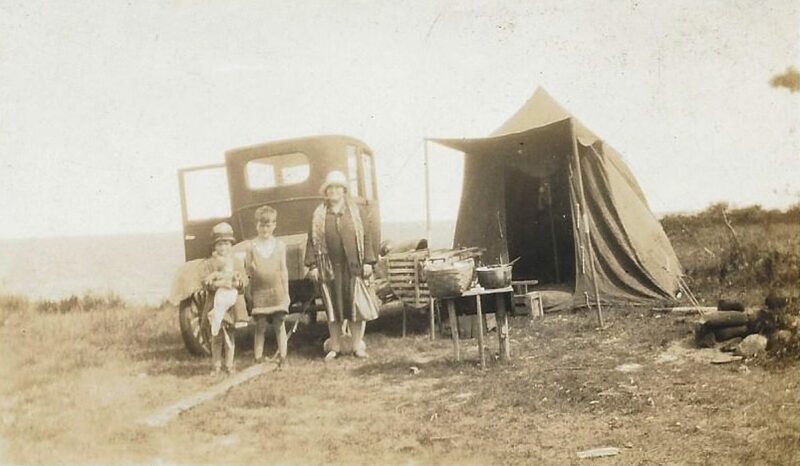 It would not be unusual to marry your first cousin in those days. I think that it would have been unusual to marry your Uncle. The above scenario would put Catherine and BV at 5th cousins. I appreciate Ancestry’s ThruLines. Even the ones that are not right can be good hints as they are based on DNA and some sort of computer based pasted genealogy. I easily fit Catherine in to existing McMaster families. BV is a shared match between me and Catherine. 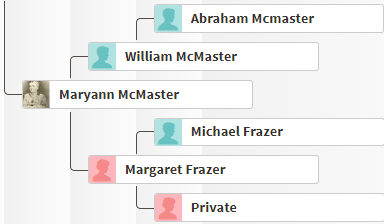 This shared match brought up a connection between McMasters that I had previously proposed in a previous blog based on a descendant of Samuel McMaster born 1853. I think I will do the ancestry dna; my nephew did it last year…but he didn’t share the results with me, like he said he would. Do you have to cmmit to an ancestry line; in other words, could they tell me about my mom’s side also? That’s great. The test is for all your lines. That’s what makes it good and what makes it complicated!